With Venezuela on the cusp of default, Caracas is hoping for more loans from Beijing. As we head into 2015, one trend at least is carrying over from 2014 – plummeting oil prices. And with the falling price of oil, major producers are falling into economic recessions. One of the hardest-hit countries, Venezuela, is a longtime partner of China and now is looking to Beijing for an economic lifeline. Venezuela, one of the founding members of OPEC, is heavily reliant on oil production. According to OPEC, oil revenues make up around 95 percent of Venezuela’s export revenues. More generally, oil and gas account for roughly a quarter of Venezuela’s GDP. Given the outsized role oil plays in its economy, Venezuela needs a global oil price of $117.50 a barrel to account for government expenses in 2015, according to Deutsche Bank. As of January 6, Brent crude oil was trading at under $53 dollars a barrel – a five and a half year low. Barclay’s expects Venezuela to announce a major currency devaluation and possibly slash government spending to avert the worst of the crisis – but still predicts the country’s economy will shrink by 6.2 percent in 2015. The drop in oil prices came amidst broader economic turmoil for Venezuela, including rapid inflation, declining production, and shortages in imported goods. With Venezuela on the cusp of economic collapse, including the possibility of government default, President Nicolas Maduro set off for what he called “an international tour … a very important tour to take on new projects, given the circumstances of falling income that our country faces.” Unsurprisingly, Maduro’s trip will include a visit to his country’s top economic partner: China. China has already extended over $50 billion in loans to Venezuela since 2007 in return for guarantees of oil deliveries in the future. With Venezuela in desperate need of financing, Maduro is hoping Beijing will once again open its coffers. However, China has proven reluctant so far to extend more cash to Venezuela beyond the $4 billion cash-for-oil deal President Xi Jinping signed with Maduro during a July visit to Venezuela. Venezuela’s Nuevo Herald, citing Inter American Trends, said that Maduro was on the cusp of winning at $16 billion loan from China, if Caracas is willing to agree to the “very harsh conditions” set forth by Beijing. According to Inter American Trends, China is once again seeking guarantees of future oil deliveries in exchange for the loan, which could require Venezuela to up its shipments to China by more than 100,000 barrels per day. Venezuela currently exports over 500,000 barrels of oil per day to China, more than half of which already go toward repaying previous loans. This is not a done deal. 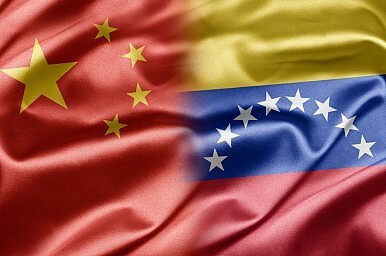 Beijing remains reluctant to commit more resources to Venezuela, in part because of the precarious economic situation. As Eurasia Group analyst Risa Grais-Targow told the Wall Street Journal, China “learned a lesson from the initial no-strings-attached loans” made to Venezuela and is unlikely to go down that path again. The death of former President Hugo Chavez, who provided a personal bond between Venezuela and China, has also impacted the bilateral relationship. Still, China has an interest in preventing a Venezuelan default. Even if Beijing does not shell out billions in new loans, it could give Caracas permission to restructure repayment of previous loans, allowing Venezuela to sell more oil instead of shipping it to China according to the original loan terms. Maduro will also stop in unspecified OPEC countries, where he will try again to convince fellow OPEC members to agree to cut production in order to shore up prices. A similar attempt last November was unsuccessful. If Maduro’s pleas once again fall on deaf ears, Venezuela’s fate will be largely in Beijing’s hands. China has adopted a more flexible attitude toward regime transition and intervention than is often realized.